Medicinal plants are highly important for the overall well-being of everybody owing to the numerous beneficial attributes derived from them. The amazing benefits of these plants are greatly dependent on the valuable chemical substances that offer countless essential physiological support to our body. Some of these key chemical compounds present in such medicinal plants include; phenolic compounds, alkaloids, flavonoids and tannins. Interestingly, majority of these medicinal plants parts such as the fruit, twig exudates, root, flower and stem can be used for producing both herbal and pharmaceutical drugs due to their numerous medicinal properties. One of such important medicinal plants is papaya or pawpaw, which is botanically known as Carica papaya L. Papaya is a very popular tropical and subtropical fruit notable for its high edible, medicinal, therapeutic and economic value. Papaya is from the plant Carica papaya, which belongs to the family of Caricaceae and the genus Carica. This fruit is originally from southern Mexico and Central America before spreading to other parts of the world. Uniquely regarded as the fruit of the Angels, carica papaya is such a plant that virtually all its parts such as the bark, pulp, fruits, peels, leaves, roots, and seeds are highly medicinal and effective for tackling several diseases. Papaya fruit is distinguished for its sweet taste, rich texture, fleshy rich orange-colored pulp and colourful yellowish-green, orange-red or yellow-orange physical appearance. Carica papaya is hermaphroditic or dioecious in nature whereby it produces only female, male or bisexual (hermaphroditic) flowers. Male papaya do not bear fruit rather it bears only pollen, unlike the female ones that bear inedible small fruits except if pollinated. Hermaphroditic papaya is capable of self-pollinating itself since the flowers bear both female ovaries and male stamens. 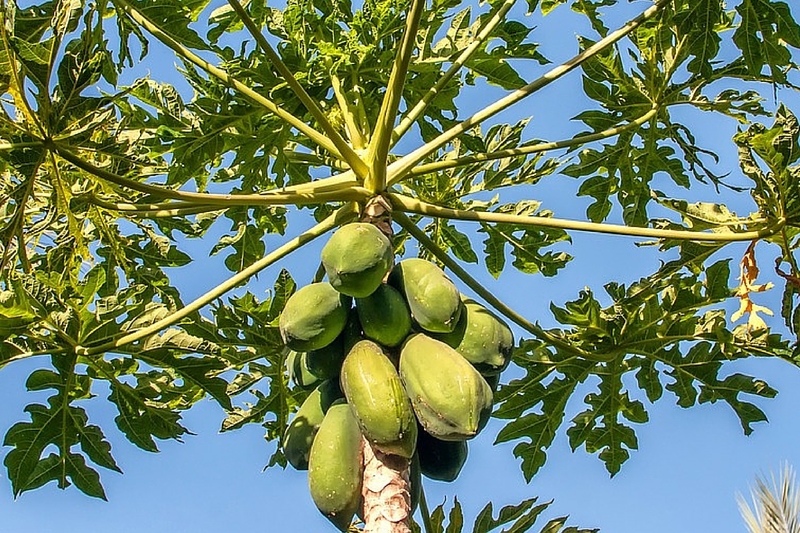 The carica papaya tree is unbranched, bears stem that grows approximately 5 to 10 m height with broad spiral leaves thriving mainly at the trunk’s top. The lower trunk has prominent marks where the previous fruits and leaves had been borne. The leaves measure approximately 20–28 inches diameter with five to seven palmated lobes. Pawpaw has an oval shape and are usually borne singly at the axil on the main stem or in small clusters. Unripe pawpaw fruits are usually green in colour while the ripe ones are yellow or orange in colour. Some cultivars of papaya include; yellow papaw (with yellow flesh), green papaya (greenish), red papaya (with red or orange flesh), red-fleshed Maradol papaya, Caribbean red papayas, Mexican Red and Yellow Papayas, Hawaiian Sunrise and Sunset Papayas, Hortus Gold papaya,Bettina and Peterson cultivars,sunnybank papayas and Guinea Gold papayas. Papaya is an excellent source of essential nutrients, minerals and phytochemicals that are highly important for our health. They include; dietary fiber, carbohydrates, protein, vitamin A, thiamine, pantothenic acid, folate, beta-carotene, niacin, lutein zeaxanthin, riboflavin (B2), vitamin C, vitamin E, vitamin K, calcium, iron, magnesium, potassium, carotenoids, polyphenols, manganese, zinc, phosphorus and sodium. Papaya can be used for treating all types of abdominal disorders such as dyspepsia (indigestion), dysentery, constipation and hyperacidity (excessive gastric juices). Papaya also facilitates the digestion of proteins due to its constituent of proteolytic enzymes. Papain (digestive enzyme), which is present in pawpaw can be extracted and dried as a powder. This can be mixed with water or honey and taken to aid digestion. Consuming ripe papaya is equally helpful for tackling constipation issues. Studies reveal that papaya contains essential compounds that foster healthy, glowing and youthful skin. The peel and the pulp are used for producing cosmetics or as a local remedy for rejuvenating damaged skin and for tackling skin diseases such as dry skin, eczema, cutaneous tubercles, pimples, rashes, warts, corns, sunburn, blemishes etc. This is as a result of the presence of vitamin A and vitamin E in this fruit. Some cosmetological industries use papaya to produce skin-lightening agents, body creams, shampoos, soap, hair conditioner, hair creams and body moisturizers. Papaya contains enzymes such as chymopapain and papain as well as antioxidants that are very helpful for reducing body inflammation. This suggests why this fruit is very effective for lowering body inflammation for individuals suffering from osteoarthritis, arthritis, rheumatism and asthma. Papaya skin is a quick healing remedy for cuts, bruises and wounds. The juicy pulp can equally be used as a poultice on wounds. The presence of antioxidants, chymopapain and papain in papaya is essential for healing burns. Papaya is an excellent source of vitamin C, antioxidants and dietary fibres that are essential for preventing the accumulation of cholesterol in the arteries. It is noteworthy that excess cholesterol in the arteries can cause several heart diseases including hypertension and heart attack. Papaya contains vitamin C and vitamin A that helps to boost the immune system thereby offering protection and resistance against certain infections such as colds and coughs. Papaya offers protection against the onset of arthritis due to its constituent of vitamin C and its anti-inflammatory properties. Regular intake of papaya is essential for promoting healthy and strong bones thereby minimizing arthritis attacks. Due to the high dietary fibre content of papaya, those seeking to shed excess fat and maintain a healthy weight should endeavour to include this fruit in their daily diet. This is owing to the fact that it aids easy digestion of food, aids bowel movement and makes one feel easily satisfied thereby leading to reduced food intake that could possibly add more calories to the body. Papaya leaves are a great herbal remedy for treating malaria especially when boiled together with dogonyaro leaves and taken as a herbal tea. Papaya is an excellent source of Vitamin A which offers protection to the eyes against macular degeneration and loss of sight. For healthy vision and sight, we all should endeavour to include more papayas in our daily intake. Researchers reveal that daily consumption of papaya is essential for preventing the onset of prostate and colon cancer. This is due to its rich constituents of antioxidants, flavonoids and phytonutrients that can prevent the body cells from being damaged by free radicals. Papain enzyme found in papaya offers great help in regulating menstruation as well eases menstrual pains. Regular intake of papaya has been reported to be very effective in delaying ageing and preventing wrinkles. This is due to the presence of vitamin E, vitamin C and beta-carotene that fight against free radicals in the body. Ripe papaya is an effective laxative as it facilitates bowel movement. If you’ve constipated for days, just eat at least a whole papaya fruit to aid with bowel movement. Papaya seeds are anti-bacterial in nature thus very effective for fighting against bacteria such as Staphylococcus, Salmonella and E.coli. Ripe papayas can be eaten without the seeds and the skins as fresh fruit or can be used for preparing food. The flower bud and young leaves can be steamed or cooked as vegetables in different cuisines while the latex, which is rich in papain can be used for tenderizing meat. The ripe papaya can be used for preparing fruit salad, jellies, jams, marmalade, soups, stews or curries while the unripe ones can be cooked before being used for preparing dishes. Some Asian dishes that are prepared with papaya such as kaeng som (Thai curry), lalab salad, Minahasan pawpaw flower vegetable meal and som tam. The black papaya seeds are edible and are notable for their distinctive spicy and sharp taste thus can be dried and ground/blended for use as an alternative for black pepper. Papaya can be taken as a muscle relaxant, reproductive organ stimulant or intestinal worm expeller. It can also be used for treating amenorrhoea, hemorrhoids and high blood pressure. Studies reveal that the latex fluid present in unripe papayas can cause uterine contractions which can possibly lead to miscarriage. The latex fluid from unripe papaya can cause oedema, allergic reactions and irritation to some individuals. Excessive intake of papaya can cause carotenemia (yellowing of the palms and soles), however this is not harmful to health. 1. Ayoola, P.B. and Adeyeye, A. (2010), phytochemical and nutrient evaluation of carica papaya (pawpaw) leaves, IJRRAS 5 (3). 2. Aravind G., Debjit B., Duraivel S. and Harish G. (2013), Traditional and medicinal uses of Carica papaya, Journal of Medicinal Plants Studies 2013; 1(1): 7-13. 3. Bamisaye, F. A., Ajani, E. O. and Minari, J. B. (2013), Prospects of ethanobotanical uses of Pawpaw (Carica papaya), Journal of Medicinal Plant studies; 1(4): pp.171-176. 4. Baskaran C., Ratha Bai V., Velu, S. and Kumaran, K. (2012), The efficacy of Carica papaya leaf extract on some bacterial and fungal strain by well diffusion method, Asian Pac J Trop Dis, pp.347-348. 5. Canini, A., Alesiani, D., D'Arcangelo, G. & Tagliatesta, P. (2007), Gas chromatography–mass spectrometry analysis of phenolic compounds from Carica papaya L. leaf, Journal of food composition and analysis, 20, pp. 584–589. 6. Changamma, C. and Lakshman, J. (2010), A biochemical study on the effect of Carica papaya linn. Seed extract in male albino rats”, Journal Applied Biosciences, (2)36, pp.168-170. 7. Chen Y. T., Hsu L. H., Huang, I. P., Tsai, T. C., Lee, G. C. and Shaw, J. F. (2007), Gene cloning and characterization of a novel recombinant antifungal chitinase from papaya (Carica papaya) J Agric Food Chem. ;55: PP. 714–720. 8. Emeruwa, A. C. (1982), Antibacterial substance from Carica papaya fruit extract, Journal of Natural Product, 45(2): pp.123-125. 9. Ezike, A. C., Akah, P. A., Okoli, C. O., Ezeuchenne, N. A. and Ezeugwu, S. (2009), Carica papaya (paw paw) unripe fruit may be beneficial in ulcer”, Journal of Medical Food, 12(6), pp.1268-1270. 10. Fenny, Y., Endang H. and Jusuf K. (2012), The effect of Carica papaya leaves extract capsules on platelets count and haematocrit level in dengue fever patient, Int J Med Arom Pla; 2(4):573-576. 11. Fullerton R. A., Taufa L., Vanneste J. L., Yu J., Cornish, D. A. and Park D.(2011). First record of bacterial crown rot of papaya (Carica papaya) caused by an Erwinia papayaelike bacterium in the Kingdom of Tonga. Plant Disease 95, 70. 13. Krishna K. L., Paridhavi M. and Patel J. A. (2008), Review on nutritional medicinal and pharmacological properties of papaya (Carica papaya Linn.). Indian Journal of Natural Products and Resources, 7(4), 364-370. 14. Mahmood, A. A., Sidik, K. and Salmah, I. (2005), Wound healing activity of Carica papaya L. aqueous leaf extract in rats. International Journal of Molecular Medicine and Advance Sciences, 1, pp.398–400. 15. Maktar, N.H., Kamis, S.; Mohd Yusof, F.Z. ; Hussain, N.H.(2008) Erwinia papayae causing papaya dieback in Malaysia. Plant Pathology. 57: p.774. 16. Ngozi, A. I., George, O. G., Veronica, I. O., Sunday, A., Tomi, D. E., Bola, O., Patience, N. D., Mojisola, O., Alero, O. and Felix, C. E. (2010), Phytochemical and antioxidant nutrient constituents of Carica papaya and Parquetina nigrescens extracts, Scientific research and essays; 5(16): pp.2201-2203. 17. Nguyen, T. T. T., Shaw P. N. and Parat, M. O. (2013), Hewavitharana AK. 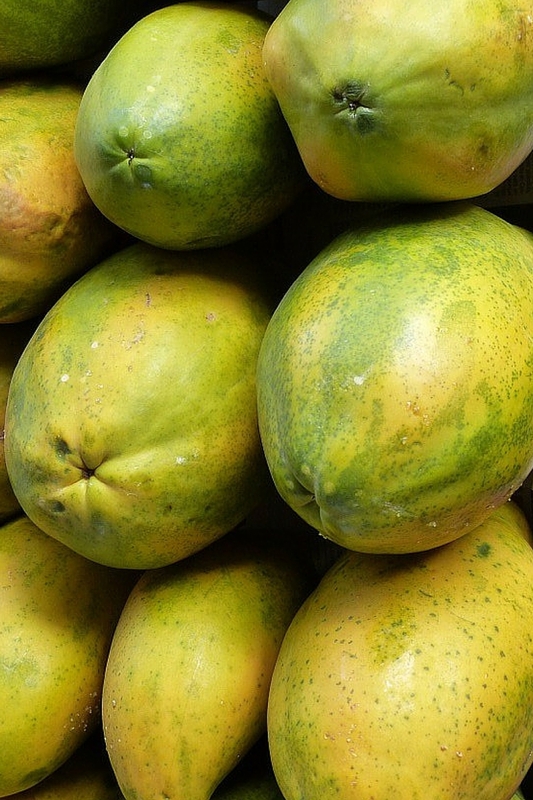 Anticancer activity of Carica papaya: A review. Molecular Nutrition and Food Research, 57 (1), 153-160. 18. Noriha, M. A., Hamidun, B., Rohaiza, A. R., and Indu Bala S. Jaganath, S. I. B., (2011), Erwinia mallotivora sp., a New Pathogen of Papaya (Carica papaya) in Peninsular Malaysia. International Journal of Molecular Sciences, 12:39-42..
19. Oduala T., Adeniyi F. A. A., Ogunyemi E. O., Bello I. S. and Idowu T. O. (2006), Antisickling agent in an extract of unripe pawpaw (Carica papaya): Is it real?. African Journal of Biotechnology, 5(20), pp. 1947-1948. 20. Okunola Alabi A, Muyideen Haruna T, Chinedu Anokwuru P, Jegede T. and Abia H. (2012), Comparative studies on antimicrobial properties of extracts of fresh and dried leaves of Carica papaya on clinical and fungi isolates, Pel Res Lib; 3(5): pp.3107-3112. 21. Olagunjua, J. A., Adeneyeb, A. A., Fagbohunkac, B. S., Bisugac, N. A., Ketikuc, A. O., Benebod, A. S., Olufowobic, O. M., Adeoyec, A. G., Alimic, M. A. and Adelekec, A. G. (2009), Nephroprotective activities of the aqueous seed extract of Carica papaya Linn. in carbon tetrachloride induced renal injured Wistar rats: a dose- and time-dependent study, Biology and Medicine, 1(1): pp. 11-17. 22. Oloyede, O. (2005), Chemical profile of unripe pulp of carica papaya. Pakistan Journal of Nutrition, 4 (6), 379–380. 23. Otsuki, N., Dang, N.H., Kumagai, E., Kondo, A., Iwata, S. and Morimoto, C. (2010), Aqueous extract of Carica papaya leaves exhibits anti-tumor activity and immunomodulatory effects. Journal of Ethnopharmacology, 127, 760–766. 24. Owoyele, B. V., Adebukola, O. M., Funmilayo, A. A. and Soladoye, A. O. (2008), Anti-inflammatory activities of ethanolic extract of Carica papaya leaves,” Inflammopharmacology, vol. 16, no. 4, pp. 168–170. 25. Sabaa Tahier Mohammed, Sahar A. H. AL-Sharqi, and Nidaa Mohammed, (2014), Anti-parasitic activity of Natural Plant Carica papaya Seed Extract against Gastrointestinal Parasite Entamoeba histolytica,” International Journal of Innovation and Applied Studies, vol. 7, no. 1, pp. 58–63. 26. Satrija, F., Nansen, P., Murtini, S. and He, S. (1995), Anthelmintic activity of papaya latex against patent Heligmosomoides polygyrus infections in mice. Journal of Ethnopharmacology, 48, pp.161–163. 27. Seigler, D. S., Pauli, G. F., Nahrstedt, A. and Leen, R. (2002), Cyanogenic allosides and glucosides from Passiflora edulis and Carica papaya, Phytochemistry 60, pp.873–880. 29. Subenthiran S., Choon T. C., Cheong K. C., Thayan R, Teck M. B., Muniandy P. R., Afzan A., Abdullah N. R. and Ismail Z. (2013), Carica papaya leaves juice significantly accelerates the rate of increase in platelet count among patients with dengue fever and dengue haemorrhagic fever. Evidence based Complementary and Alternative Medicine, 1-6. 30. Uche-N wachi E. O., Ezeokoli, D. C., Adogwa AO and Offiah VN, (2001), Effect of water extract of Carica papaya seed on the germinal epithelium of the seminiferous tubules of Sprague Dawley rats, Kaibogaku Zasshi,76(6): pp.517-520. 31. Udoh P., Essien I., Udoh F. (2005), Effect of Carica papaya (paw paw) seeds extract on the morphology of pituitary-gonadal axis of male Wistar rats. Phytother Res.;19:1065–1066. 33. Yogiraj, V., Goyal, P. K., Chauhan, C. S., Goyal, A. and Vyas, B. (2014), Carica papaya Linn: An Overview, International Journal of Herbal Medicine; 2 (5): pp. 2-5.